Office Girls is the only Taiwanese drama that I am watching even without subs. The last time I watched a drama without a clue on what’s going on onscreen was my OTP’s Why Why Love four years ago. It shows the little steps that the two have taken to get to where they are now. But first, the confession and proposal. I didn’t expect less from Qin Zi Qi and only him can get away with a broccoli bouquet and a lottery ticket. The boy who doesn’t eat broccoli has not only started eating it, but is even giving it in lieu of the roses that I would expect a brat like him would be more inclined to give. And Xing Ren, you never really know you’ve hit the jackpot with him. 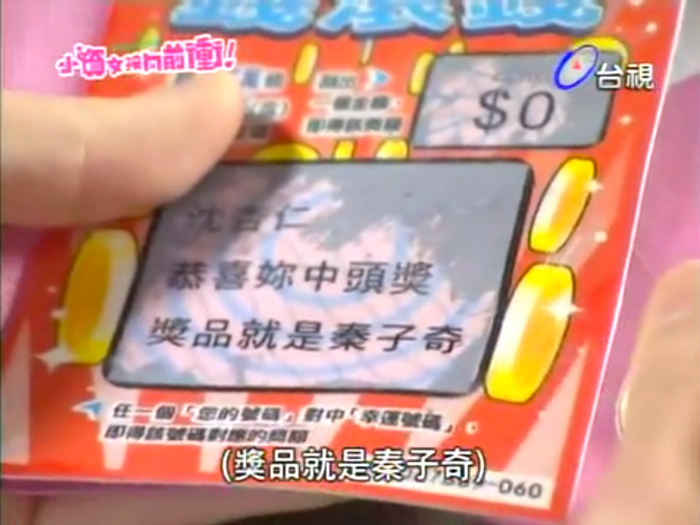 This is one of those moments I wish I could read Mandarin and know what’s written on the card. And they seal it with a kiss with Taipei 101 as their witness. I can’t believe it took 14 episodes till we got to this and I haven’t been complaining and getting all angsty. The story of Qin Zi qi and Shen Xing Ren is one of the best developed romantic plots I have seen on Taiwan TV. I like how they hug at the end of the scene. And of course, that broccoli is such a scene-stealer I swear. The morning after… the first morning of the rest of their lives, maybe? Seeing this scene is perhaps how Xing Ren felt when she saw her first NT$1 million in her bankbook. Six more episodes to go… and the plot just thickens. But more than the office politics, I am more interested to see how they are going to resolve the story arc on Qin Zi Qi’s real identity. It’s one of two major plots in this drama, the other being Shen Xing Ren’s simple dream to buy a house for her mother, who may be dying. The rest of the sub-plots are just spices that make this drama interesting to watch and made me sit still this far and remain interested. I guess the charm of Office Girls has been its down-to-earthness. It may not have the lines of In Time With You, but it’s being ordinary is what makes it special. And of course, there’s Roy Qiu. And his broccoli bouquet. Roy Qiu, why you so adorable?